You get a really cool idea when you’re in the shower. The market is saturated—how are you going to compete? My cousins, friends, sister-in-law tried that, and it was a ton of work, are you ready for that? So-and-so is doing that now; you should check it out! Here are 46 books on the topic you should read first. Now you’re spinning. You have so much research to do, and books to read, and you need to check out the similar offers, and competition and oh-my-gourd this is going to be way too much work, and you’re so not ready. So you quit. Put the project down, hopeless, you’ll never have that one great thing. What happens when you share your creative and big beautiful ideas before they’re ready? What could happen if you stopped seeking advice for one week, or even one month? Or at the very least, waiting until your idea was ready to see the light of day. Do you know someone who immediately gets an idea and then shares it right away? Maybe to validate the idea to give them the courage to take the first step. What if you had a fun new idea and instead just let it sit? Schedule an hour in the coming week to do nothing other than just thinking about it. A completely blank hour, no noise, no distraction - just you and your idea hanging out. The problem with sharing your ideas before they’re ready is that a well-meaning idea receiver could squash your concept and then you stop pursuing it when it may have been something that you should have pursued. Or, someone with great intentions may steer you in a direction that they would have headed—which may not be the best direction for you and your unique gifts. Perhaps an advice detox might be just what you need? This isn’t to say we should never seek advice from anyone, ever again. Be mindful who you seek advice from. Do you want business advice from your dad who believes you should focus on climbing the corporate ladder? Do you want advice on your book topic from your mother who wouldn’t be part of your target audience? Are you ready for advice? What specifically do you want advice on? Whose opinion would you like on your idea? Do those people fully understand you and your business? Do the advice-givers know your biggest business goals and dreams? 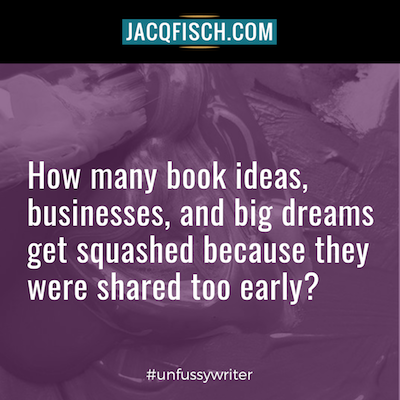 How many book ideas, businesses, and big dreams get squashed because they were shared too early? Maybe you would have accomplished more on your idea before getting advice. You may have let the idea soak in just enough to solidify your idea just a little bit more so that when you receive advice, you’d know what advice to keep and what to ignore. If you waited, maybe you’d start a fun new project. No audience required. And maybe it will be one that you finish.